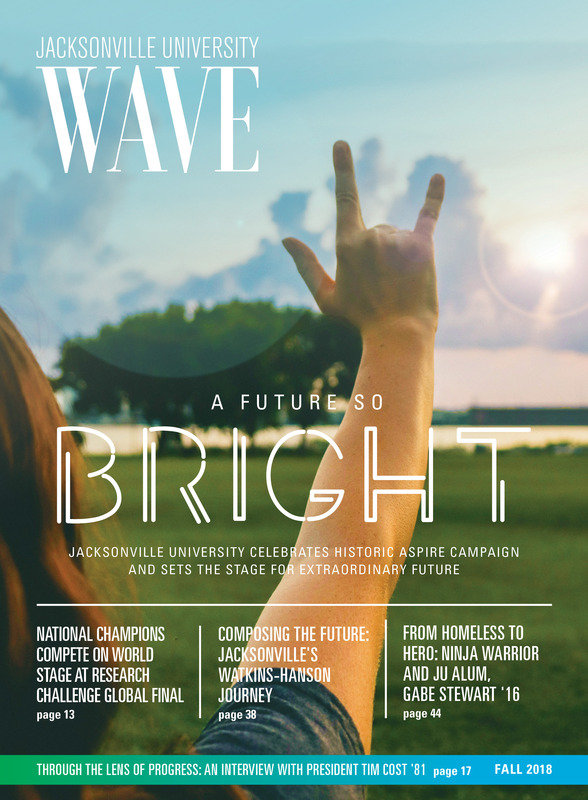 From its 2012 inception, the comprehensive ASPIRE Campaign set out to be the largest, boldest fundraising venture in the history of Jacksonville University. Now, six years later, that challenge has been met. Thousands of investors believed so much in this university’s work and collective potential that the contributions have now surpassed ASPIRE’s original $85 million goal by $36.4 million—and ahead of schedule, two years before the campaign’s planned closing date. The five areas highlighted here represent only a small portion of ASPIRE’s tremendous and historic impact. A complete look at the campaign’s effect on JU would include nearly every facet of campus, including academics, athletics, campus life, infrastructure, faculty, staff and most importantly, students. The celebration of this campaign does not mark an end. Instead, ASPIRE marks a commemoration of progress and will serve as a foundation for our bright future. An ASPIRE scholarship is so much more than a check. Each scholarship award gives its recipient a community, mentorship, and, often, a life-changing opportunity for an incredible education. Awarded to incoming freshmen for the duration of their four-year undergraduate careers, ASPIRE scholarships have made a profound impact on the experiences of students while also creating new, more personal, and rewarding relationships between students and donors. ASPIRE scholarships have removed financial barriers for many of the university’s best and brightest, enabling them to pursue success at JU. Top photo: Baptist Health Ebola Training in the Keigwin School of Nursing Simulation Training and Applied Research (STAR) Lab. Bottom photo: OCEARCH at Jacksonville University. Encompassing all academic disciplines across campus, ASPIRE has contributed to major advancements in new and renovated academic facilities, new professional degree programs that act as direct pathways to in-demand careers fields, and hundreds of nationally-recognized partnerships with industry-leading organizations. There is no clearer example of this than the Brooks Rehabilitation College of Healthcare Sciences (BRCHS). The College has demonstrated a seemingly inexhaustible commitment to growth by creating hundreds of partnerships, more than 20 degree programs and certifications, a 30,000 sq. 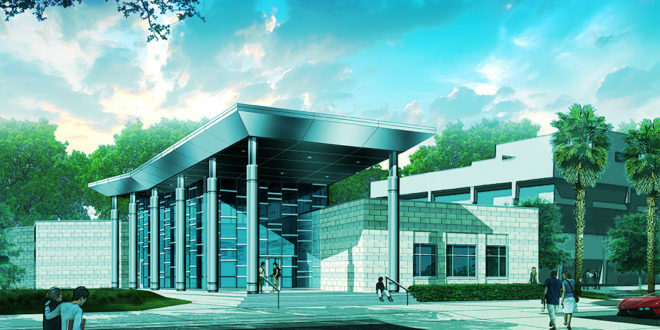 ft. BRCHS facility, a state-of-the-art Simulation Training and Applied Research (STAR) lab, and built a national reputation for academic excellence, making it one of the most visible and impactful markers of ASPIRE. Led by former Dean and now Provost Dr. Christine Sapienza’s incredible expertise and vision, the growth of BRCHS has been made possible through the generosity of both industry-leading partnerships like Brooks Rehabilitation and Baptist Health and generous philanthropists like Jack and Beverly Keigwin. Most recently, the college has begun development of a new three-story, 100,000 sq. ft. facility to accommodate more opportunities for clinical and experiential learning. Outside of BRCHS, another innovative academic partnership is OCEARCH at Jacksonville University, which has brought students to the front lines of high-caliber research and collaboration by working with industry-leading marine science researchers and universities across the country. Representing nearly twenty-five percent of the student body, student-athletes are leaders in all areas of campus, earning more academic and leadership recognition than any other representative student body. ASPIRE has helped the University meet the demand of these exemplary students by creating or renovating athletic facilities. Over the past 10 years, JU has executed construction and renovation projects for the athletics department that include the Jacksonville Lacrosse Center (JLC), Historic Swisher Gym, D.B. Milne Field, Autrey Track Complex, Southern Oak Stadium, C.P. Cost Baseball Pavilion, Pruitt Softball Complex, Nimnicht Fitness Center and more. These projects were made possible through volunteer leadership and generous donations. The JLC broke ground this summer and is a $1.875 million facility that includes a 8,600 sq. ft. building that will serve as the new home for both the men’s and women’s lacrosse programs. It will be located adjacent to the grandstand on the north end of D.B. Milne Field and is scheduled to open Fall 2018. From top to bottom: Dolphin Green, Williams Hall, and Nelms Plaza. From renovating, creating, refurbishing, updating, expanding and revitalizing, ASPIRE has played a vital role in building physical spaces that modern students need in order to thrive. 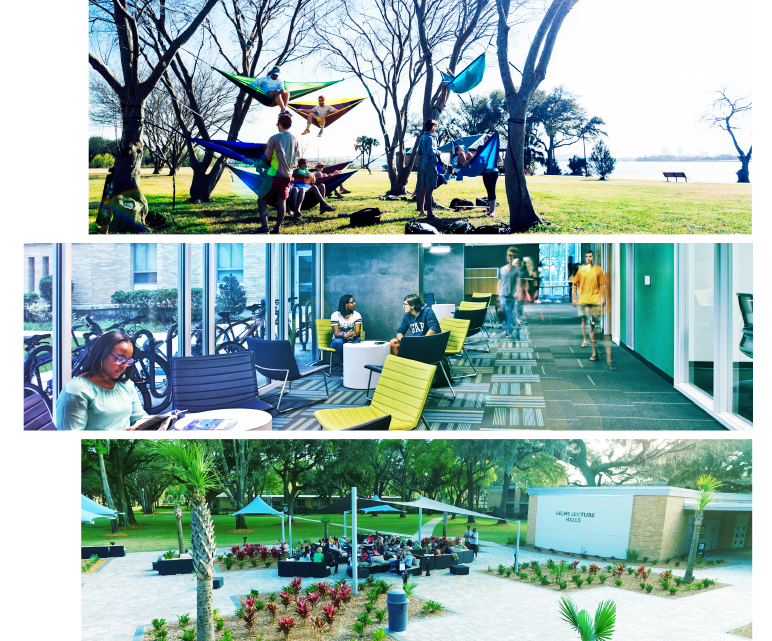 Indoor and outdoor living spaces that are both engaging and collaborative are a priority for current and incoming students. These spaces, made possible through unrestricted six-figure investments, are expanding JU’s borders and are being developed in nearly every corner of the campus. “Investing in the residential experience by creating innovative living and learning spaces is a key element in our goal to enhance the student experience, both from a co-curricular perspective and academically,” said Dr. Kristie Gover, Senior Vice President, Dean of Students. 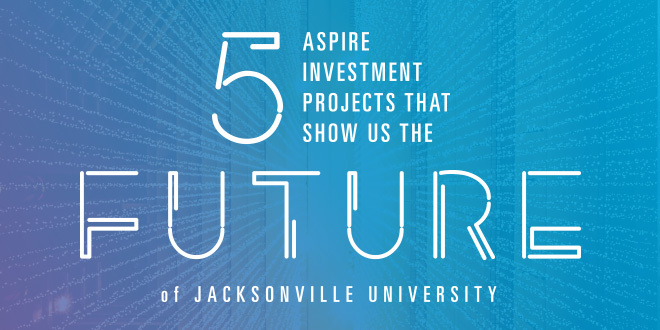 Whether through academic conferences, campus-wide community service projects, world-class fine art performances, energizing athletic events, speaker series, class reunions, or campus tours, Jacksonville University has never been more accessible. During the 2017-2018 academic year alone, the University welcomed more than 10,000 visitors and guests from across the country and around the world. 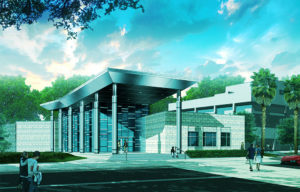 To further the effort to accommodate these guests, the University has broken ground on the new Frisch Welcome Center made possible by a generous donation from the Frisch family. The centrally-located new facility will feature the Kinne Welcome Gallery, made possible through the generosity and vision of Chancellor Emerita, Dr. Frances Bartlett Kinne. The Center will be a home for the admissions team and serve as a distinctive gateway into Jacksonville University. The single-story, 11,750 sq. ft. building will be located between the Gooding and Howard Administration buildings and is scheduled to open Spring 2019. 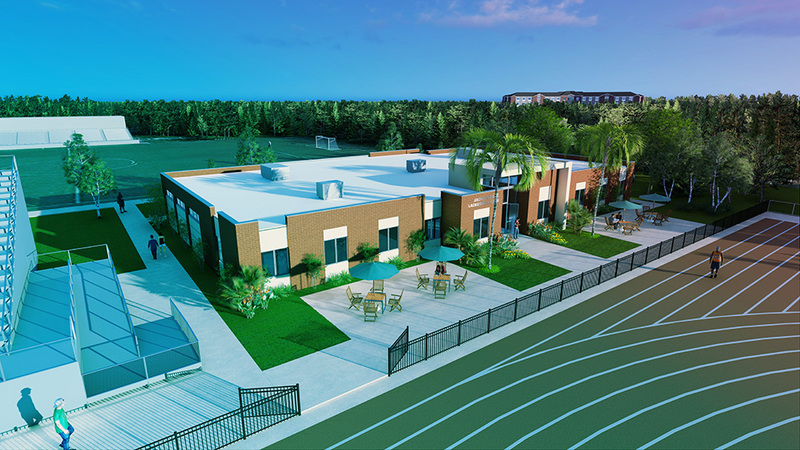 In addition, ASPIRE has powered renovations of spaces allowing JU students not only to compete with universities nationally but also to share their talent with the community and the world. One major upgrade was to Terry Concert Hall, which now features an expanded, more versatile stage, a custom glass sculpture by Professor Brian Frus and his students, finely tuned acoustics, and premium lighting—all made possible through ASPIRE, the EPIC program, and a generous investment by Mary Virginia Terry, Trustee Emerita.